Here’s the scoop on my “NOMADS TRILOGY,” a compendium of three books in one volume – short fictionalized stories which reviewers have compared to Lydia Davis. I began the series in 2000 when I was working on “Another Day in Paradise,” a book about international humanitarian relief workers. That was an intense experience as many stories were about war and natural disasters. In order to keep myself sane I began to sketch small fictionalized stories just for myself. It was all I had time to do in between travelling, interviewing and editing manuscripts. The atrocities I was witnessing, or reading about, were heart rending. As a child of refugees myself, I was drawn to the subject, and also traumatized by it. I needed release and solace. These short NOMADS stories are the result. I showed a few to writer friends and they commented on the precision of the writing, the unusual genre I’d chosen—some were even very funny – and the experimental feel of the work. Even after “Another Day in Paradise” was published, I continued writing these short stories as an exploration and a writing practice. Titles began to accumulate in my journal. Before long I had enough pieces for the first volume. Two more followed, and now I have published them all together. All three books were launched as “theatrical evenings” at the Cornelia Street Café in Manhattan by actors taking turns on a small stage reading a selection of stories. 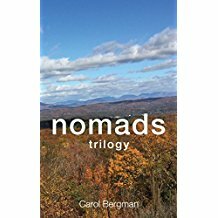 I look forward to another performance event soon to celebrate the publication of “NOMADS TRILOGY.” Carole, I hope you will be there! It will be wonderful to see you, as ever. As for me, how can I not admire Carole Bugge? That is a rhetorical question. Thank you again for your interest in my work, your professional companionship, and your inspiration and imagination. Thanks for the very flattering remarks, Carol – it is you who inspires me, I think. I didn’t know until I hosted this blog that you were following relief workers. How heroic, of them and of you. I would truly love to come to your next theatrical reading – please keep me on that invite list! And thanks again for guest blogging, my friend!